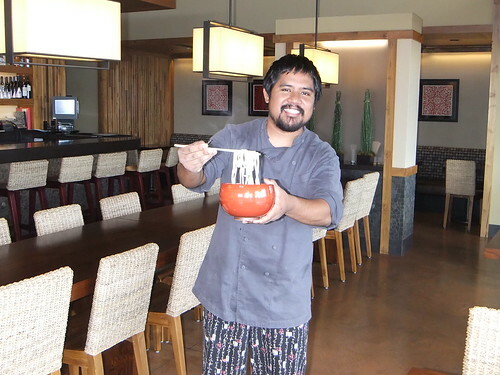 Maui Chef Sheldon Simeon is more than a rising star in food. He’s pretty much on a roll right now when it comes to being nominated and recognized in the industry. He’s responsible for the amazing menus at Star Noodle and Leoda’s Kitchen and Pie Shop but he’s also still a humble local boy from the Big Island. So when he contacted me with his latest nomination for Food and Wine Magazine‘s “People’s Best New Chef 2012,” an award that honors talented innovators who have run their own kitchen for five years or less, I was thrilled. He’s the only nominee representing Hawaii nei, and he joins nine other chef nominees for the Northwest and Pacific Region. It’s a real peoples choice award, and you can vote at http://foodandwine.com/peoples-bnc . He’s up against 99 other chefs in the US, and the winner will be announced on March 12, 2012. MAUITIME: Congratulations on this Food and Wine “People’s Best New Chef” nomination! What are some of your other accolades in Food and Beverage? MT: Wow! No shame, Chef! I’m sure winning Best of Maui best chef and best new restaurant back to back is one of your proudest moments, but how do you define success as a chef on Maui? SIMEON: The ability to showcase local ingredients and incorporate local culture into your food. The food scene here on Maui is constantly growing. Just as important as the sightseeing and activities, visitors are planning their stay here around, “where are we gonna eat?” As a chef, if I am able to have someone maybe taste a super sweet Olowalu tomato or eat raw ahi or experience local flavor combinations that they otherwise wouldn’t have anywhere else, I would feel that I’ve contributed as a chef here on Maui. MT: What dishes are you most proud of on your menus at Star Noodle and Leoda’s? SIMEON: The Pohole Salad. This dish reflects my homegrown roots of Hilo. MT: Ok, Star Noodle’s Pohole Salad is truly amazing. Any other dishes that stand out? SIMEON: I’m also proud of the fresh made noodles that we make in house. Just the process of making our noodles, from carefully mixing in the water to the flour, to rolling it out on our 75-year-old noodle machine, to drying it overnight, cooking it all fresh in the morning, to hand drying it, makes it very special. MT: What Maui ingredients are you fired up about utilizing in the kitchen? SIMEON: The taro from our very own Hoaloha Farms. Bobby Pahia is doing any amazing job of cultivating some of the best looking crop I’ve ever seen up in Waikapu and Wailuku. We make our own poi at Old Lahaina Luau and Aloha Mixed Plate. I have taro chips and taro vinaigrettes, and you will see taro dishes as a special of the day at Star Noodle and Leoda’s. MT: What makes cooking a pleasure more than a job for you? SIMEON: Cooking to me is very intimate. You touch it, smell it, taste it. I love that I get to share that moment when someone tastes your food. Food always conjures up memories. I’d like to hope it’s mostly positive when tasting my food, but nothing is more satisfying to me than someone having the reaction of “this reminds me of my childhood” or “that’s like mom’s cooking”–something along those lines. MT: Do you still work in the kitchen a lot? SIMEON: I do still get in the kitchen and cook a bit. It’s what like I to call, “rubbing elbows with the crew.” It’s still important to me to be able to constantly mentor by example. However, with the popularity of Star Noodle and Leoda’s, there has been a rise of responsibilities outside of the kitchen. MT: Do you cook at home? SIMEON: I don’t get to cook at home as much as I’d like too. My wife Janice does most of the cooking for the family. But when we do have the chance to have company over at the house I love to throw down. I enjoy nothing more than cooking over the hibachi… of course, with a nice, cold beverage in hand. MT: What’s your favorite thing to eat if you are not cooking? Who makes it? SIMEON: Raw Crab and Opihi. Usually I will be eating these at some kind of local party like a first baby luau or graduation party. But I will go to town on Raw Crab and Opihi! Once again, you can vote for Chef Sheldon Simeon at http://foodandwine.com/peoples-bnc or follow the hashtag #peoplesbnc to keep up with Twitter chatter. Voting starts March 5 and goes through March 11.